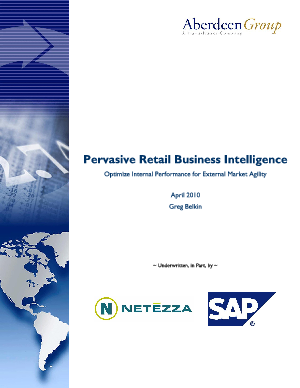 Retailers are turning to pervasive business intelligence (BI) to improve internal process visibility on an enterprise-wide scale. Pervasive BI solutions help retailers establish a more holistic, agile, and inclusive view of their business by achieving faster access to actionable data and providing insight to and from all ends of the organization. The result is the ability to quickly react internally to changing external market conditions. For example, according to Aberdeen’s January 2008 Business Intelligence in Retail: A Best-in-Class Roadmap for Performance Management benchmark report, the need to quickly react to changes in customer demand was the top pressure driving BI use among retailers (50%). Aberdeen Group defines "Pervasive BI" as the existence of an information environment where access to and usage of business intelligence capabilities is available to all stakeholders in an organization when, how, and where they work.